This week, I want to share some of the books we're giving as gifts this year to various friends and family members (that hopefully don't read this blog!). First up are a pair of gorgeous board books for toddlers and preschoolers. These are going to a 2 1/2 year old boy but we will probably buy another set for a 1 year old. If you don't know about Steve Jenkins, you're missing out on some of the best non-fiction picture books for kids. Now he has illustrated two new board books for the American Museum of Natural History. 1-2-3 Dinosaurs Bite! 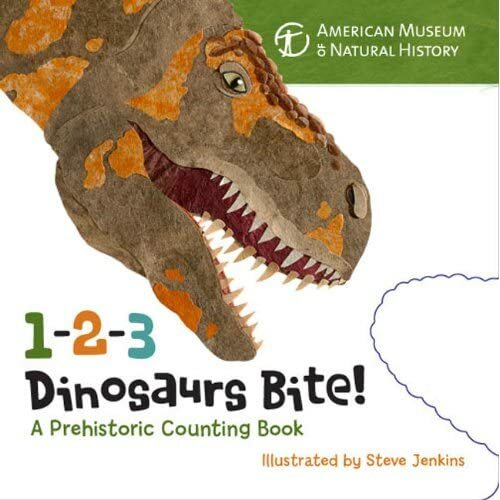 A Prehistoric Counting Book is, obviously, a counting book. It has bites out of the pages which kids always seem to love. But adults will love that pronunciations are included for the dinosaur names. Microraptor seems easy enough but when you hit Dilophosaurus [dye-LO-fuh-SAW-rus], you'll be a happier reader thanks to this feature. I wish the book was a full ten dinosaurs though. It only features five species and then it speeds through the rest of the numbers. Of course, I've forgotten about short attention spans and this book is probably just the right length for young listeners. 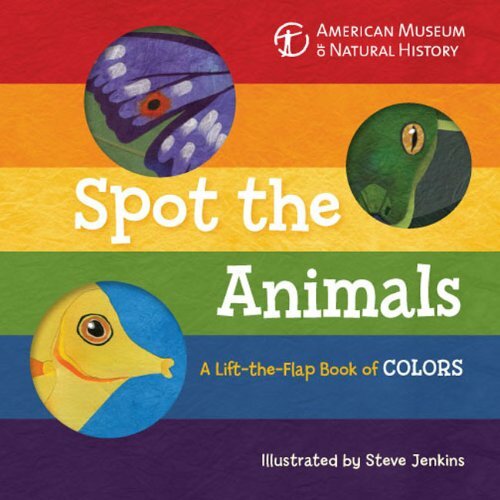 Spot the Animals: A Lift-the-Flap Book of Colors matches up animals and colors in an ever-popular lift-the flap format. These are sturdy board book flaps (actually just double-sized pages that fold out) which make the book perfect for little hands. I guarantee these aren't going to tear off! The colors are bright but not garish. And, as you can see peeking out from the front cover, it features Z's favorite snake, the emerald tree boa. When these two books arrived in the house, Z immediately grabbed them. I had to actually ask him to stop looking at them after a while so that they would still be in gift condition. With gorgeous art and a little bit of learning, these would be perfect for most little readers and pre-readers. Oooooh! I like the spot the animals book! Especially with the pull up flaps. I think Elle would love this. I bet she would. The colors are gorgeous! And kids really do love flaps, don't they? I could see why he grabbed them! I love how he's still willing to read picture books and board books when they're something that interests him. I feel a little sad for kids who leave them behind.